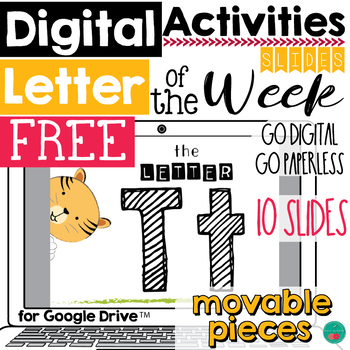 This is a letter of the week digital resource for the letter T.
You can find the Whole Alphabet BUNDLE here. And when you visit the bundle page, you can find links to every letter, if you just need one or two more. 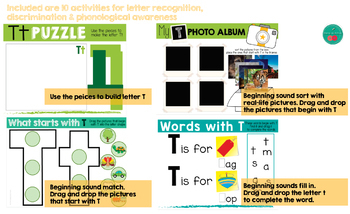 A link to a resource for Google Drive, Slides ™ that includes 10 letter T recognition and discrimination activities. Take a look at the preview to see them all! Once you get your download, you will make a copy and have it on your own Google Drive. You can then use it in your Google Classroom. 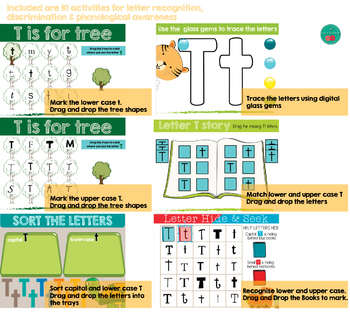 Take a look at other ABC activities in my store. Click. © 2018 Google LLC, used with permission. Google and the Google logo are registered trademarks of Google LLC. Cherry Workshop © is not affiliated with or endorsed by Google Inc.